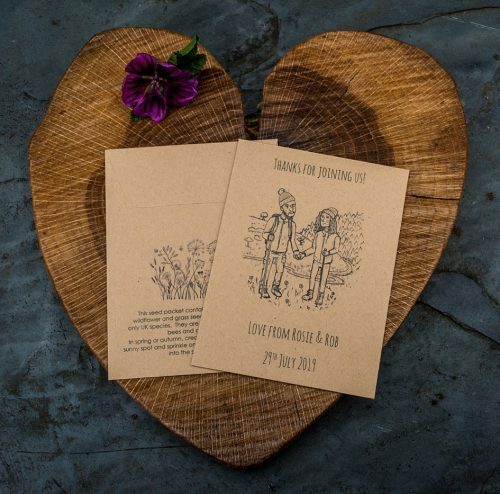 This product listing is for ordering the artwork to be designed from the photograph of the happy couple. This will be a black line drawing (in the style of the product photograph) and will be unique to yourselves. Please email the photograph and any accompanying info needed for the artwork (eg, if it is important to emphasise, say, a bushy beard! 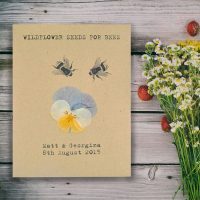 ), and the names and wedding date. The finished artwork will be emailed for approval and, once you approve, the digital file will be emailed to you. 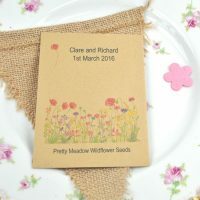 The email address for the info our designer needs is info@wildflower-favours.co.uk. If you wish the artwork to be printed on a seed packet wedding favour, please order the seed packets via this link – Bespoke Happy Couple Seed Packet Wedding Favour – and a proof of the seed packet will also be emailed before printing.